RUSH: I’m looking at the clock. I don’t have sufficient time. 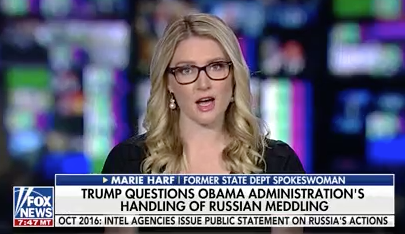 We have a Marie Harf sound bite coming up, and it’s awesome. The only thing it’s missing… She was on Fox a couple hours ago, and the only thing that’s missing is her pronunciation of the word “admini-shration,” and it was all of this sound bite, and it was hoping when I requested this that it would be in there, but it didn’t fall within our allotted time. But it was… No, Michelle Obama. We’re down for the sh’truggle, “admini-shtration.” It’s almost now a required pronunciation technique of women on the left pronouncing that word. Believe me! I observe these things. Now let’s go to Marie Harf. What’s being discussed here? Russian meddling in the 2016 election. And it has come to light — and we were on the cutting edge of this — remember Obama bragging how he had told Putin to cut it out? And Obama telling everybody the Russians couldn’t affect the outcome of our elections. They’re too complicated. They’re too complex. And Obama let everybody know it wasn’t that big a deal. Remember, everybody thinks Hillary’s gonna win. Obama couldn’t start giving credit to the Russians for being able to affect anything because that would taint her win. So Obama’s out there basically saying the Russians are meaningless, they can’t do anything because nobody wanted to taint what they all thought was gonna be Hillary’s victory. HARF: My former boss and others confronted Russia repeatedly over this, and we did take steps. Publicly before the election we came out and named and shamed Russia so voters would know what was going on, and we eventually expelled dozens of diplomats. HARF: We also had a Republican candidate at the time, Donald Trump, who was on this campaign, speeches saying, “Russia, please interfere. Please hack Hillary Clinton, and please release those emails.” So we were confronting a candidate who was actually encouraging Russia. It’s absurd. It is mind-blowing. They really think this. I tell audiences when I speak, I give them examples of what liberals say, and they start laughing, and I stop them. And I say, “Folks, they believe this. They believe this stuff.” As a predicate to saying there’s no compromise with these people and there’s no educating them. There’s no bringing them up to speed. These people have to be defeated. 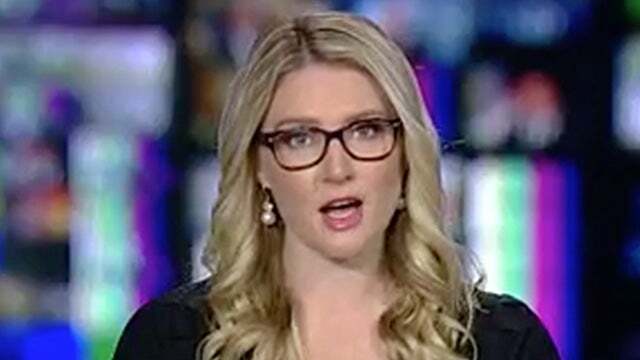 Marie Harf, for all of her education, and for all of her sophistication, for all of whatever else she has, is ignorant, just plain, flat-out ignorant. This is what Trump said. I’m sure you’ll remember it. It was July 26th, 2016, in Doral, Florida. And it’s what triggered this whole thing. And at the time everybody’s trying to find out what happened to Hillary’s emails. She had 60,000 on her server. She deleted 30,000 and turned 30,000 over. Those 30,000 that she deleted, they have to be somewhere. Comey said he couldn’t find them. Comey in his July 5th press conference, which is about three weeks prior to this, had exonerated Hillary. They couldn’t find the 30,000 emails. They weren’t looking very hard. But it was a subject of interest. 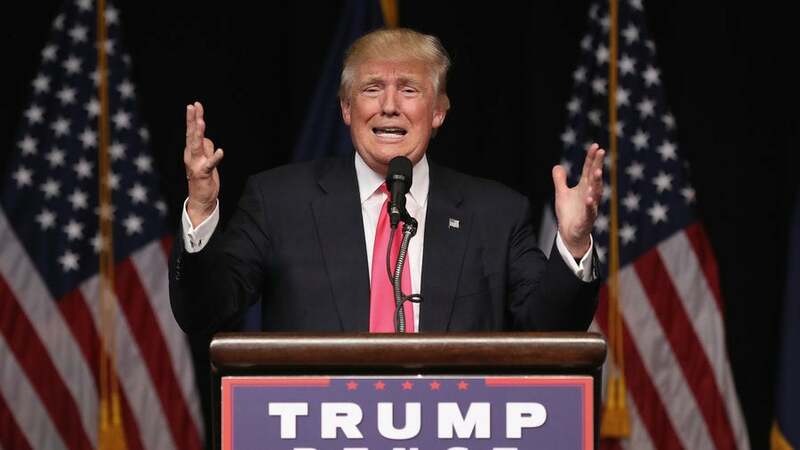 TRUMP: I will tell you this: Russia, if you’re listening, I hope you’re able to find the 30,000 emails that are missing. I think you will probably be rewarded mightily by our press. Let’s see if that happens. RUSH: I watched it. I watched it and I’m laughing myself silly. I’m saying, “This is exactly how I would approach it. This is great parody, great satire. This is ramming it right down their throats. ‘Hey, maybe if you guys can’t find… You guys say Russia’s doing this and you guys say Russia’s doing that. Well, hey, Russia, maybe you can find these emails, and if you do, turn ’em over to our media,'” and look how they interpreted that. This bite… Now, you might think, “Rush, this is nitpicking. You don’t talk about the way people talk.” Well, yeah, I understand that. But Marie Harf sounds just like Michelle Obama. Look, I’m a speech student. I’m a breathing student. I am a student of the diaphragmatic method. I listen to the way people enunciate. I listen to the way people pronounce. You can learn a lot from it, and there are certain things that just stick with me, and I wonder where they are rooted and why they are never corrected, and Michelle Obama is constantly… If she ever says the word “struggle,” it’s “sh’truggle.” 42nd Sh’treet. And Marie Harf here. Here’s the loop. This is Marie Harf talking about where she worked…. HARF: The Obama admini-shtration. The Obama admini-shtration. The Obama admini-shtration. The Obama admini-shtration. The Obama admini-shtration. RUSH: Okay. Okay! That’s good. You get the idea. “Admini-shtration.” I know you’re saying, “So what, Rush? Why are you wasting valuable programming time with this observation?” Because it just fascinates me. “Admini-shtration.” If somebody told me that I was pronouncing a word that way, I’d fix it. It’s all I’m saying. RUSH: There’s Obama in 2016. (paraphrased) “It’s not possible! It isn’t possible, unprecedented. Nobody’s ever whined and complained about election results beforehand.” BS! The Democrats do it before every election. The Democrats are constantly shouting about voter fraud.